Twenty nine women travelers tell us about their stories while on the road. One such women is Ellen DeGeneres whose fear of flying is so reminiscent of so many other people's experiences. I love Ellen's writing and she had me chuckling as usual. We've all got travel stories to relate, some hilarious, some downright scary. 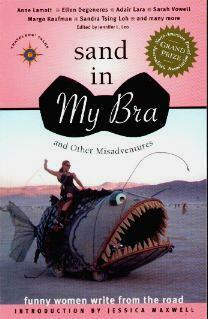 Edited by Jennifer L. Leo, she has coralled some wonderfully amusing travel anecdotes I feel sure you're going to love. Whether you're a traveler yourself or an armchair tourist, you're bound to get a kick out of these stories, especially when there's a foreign language to be attempted. I liked Christine Nielsen's "Sand In My Bra" story as well as "The Aunties" by Anne Lamott (oh how humorously she wraps up our every dilemma), and Jennifer Colvin's encounters with men exposing themselves. Unfortunately it's happened to too many of us! Joann Hornak's encounter with charging elephants put my heart in my throat. Poor Christie Eckardt, losing her knickers while out walking in a city on the Arabian Peninsula. Many weird, awkward, and wonderful things happen while vacationing but somehow, we forget them. This is the perfect book to take with you on your next trip. The stories are short and won't take up much of your holiday time. Conclusion - I thoroughly enjoyed this book and hope there's a volume 2 out soon.